Fingerprint authentication will become a lot more common on smartphones of all prices as sensors get cheaper -- and Google's integration of the technology in the next version of Android will make it much easier for app developers and service providers to make use of them. Fingerprint Cards has seen a growing interest in its technology from smartphone manufacturers in recent months, as well as a strong increase in orders. As a result, the company has raised its revenue estimate for the year from about 1.5 billion Swedish kronor (US$185 million) to 2.2 billion Swedish kronor. "This market is really starting to take off," said Jörgen Lantto, CEO at Fingerprint Cards, who anticipates that half of all smartphones sold next year will have the feature. Fingerprint Cards sensors are already used in the Ascend Mate 7 from Huawei Technologies and Oppo's R7 Plus, which was launched in May. Synaptics, which makes the sensor in the Galaxy S6 and S6 Edge, is equally sure that smartphones with fingerprint sensors will become more popular. "The market is hot, and the adoption rate across a broader range of products will grow faster now," said Anthony Gioeli, vice president of marketing for Synaptics biometrics business unit. Google adding native support for fingerprint sensors in Android M is a major reason why the technology has started to take off on a larger scale. The native support will make it easier for smartphone manufacturers to integrate fingerprint sensors in their devices. It will also make life easier for developers, who can use Android APIs to integrate fingerprint recognition in their apps instead proprietary ones developed by the sensor makers, Lantto said. 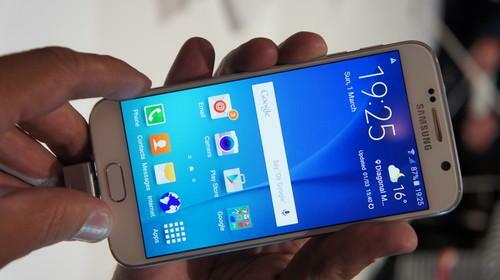 Developments on the hardware side are also lowering the bar for fingerprint recognition. Prices have come down by about 25 percent in the last year, and they will continue to drop as volumes increase, Gioeli said. It's already possible to build a US$150 smartphone with fingerprint recognition, according to Lantto. The launch of the iPhone 5s with Touch ID proved to be a blessing and a curse, at least a short-term one. On the plus side, it helped increased awareness. But many competing smartphone vendors wanted a touch sensor, just like Apple had gotten from its 2012 acquisition of AuthenTec, instead of the swipe sensors Fingerprint Cards and Synaptics had developed. It took six to nine months to regroup, Lantto said. Beyond Apple and Samsung, many Chinese vendors have been adding fingerprint sensors to their smartphones. Huawei will certainly offer it in more future models, according to a spokesman at the company. Using fingerprints as opposed to PINs or patterns has proved ideal for heavy smartphone users, he said. Fingerprint Cards has recently added Yulong and Gionee to its list of customers. Many of the more established vendors, such as LG Electronics and Sony, are still on the fence. HTC recently launched the One M9+ for the Chinese market. Mobile payments will likely help fuel the availability of fingerprint recognition on more devices. If Google wants its upcoming Android Pay service to take off, it needs to convince more vendors to integrate the technology. Allowing Google to offer the same functionality as Apple Pay. Just adding fingerprint recognition to this year's Nexus smartphones won't be enough. The same goes for Samsung. If the company wants Samsung Pay to be successful, more devices than the Galaxy S and Note products have to equipped with the technology.